What a pleasant surprise it was to cheer home Andrassy to a first up victory in the Racing Victoria Off The Track Plate at Caulfield on Saturday, the talented four-year-old expected to run well but also expected to be improved having not raced since mid-November. Whilst Andrassy was able to win first up over 1200m at Sandown last time in, she was kicking off in stronger company this time, hence her double figure odds! But she travelled sweetly in the manner of a favourite for Matthew Allen, settling well just behind the pace and taking the gap when it came early in the straight. In fact so quickly did she take it that she was left in front a fair way out, the race looking to be in the keeping of Bon Rocket who made a strong late lunge only to find Andrassy was able to kick on strongly. "She was great," Allen enthused. "She pinged the gates but there was good speed on in front and she travelled up beautifully behind them. When I clicked her up she picked up really well and went into another gear." "I hit the front a bit too soon but she hung on really well, she is a nice mare." Allison Sheehan was understandably delighted to see her second home-bred winner in three days - Andrassy's full brother Jawsome having broken his maiden in similarly game fashion at Pakenham on Thursday night. "I was a little bit surprised," she admitted as Andrassy crossed the line. "I thought she'd run well as she was good first up last preparation but she was resuming a Class 1 horse back then. For her to win a race like this... well I don't know what to say!!" 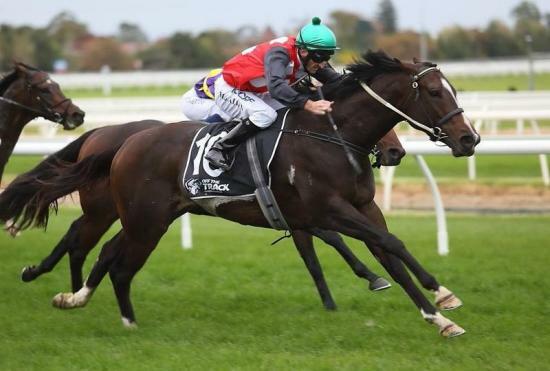 Hoping to get Andrassy to Adelaide for their upcoming carnival, Sheehan said that a break in the weather would be welcome with the mare at her best with "a bit of give in the ground." "She is such an easy horse to train," she said, adding that she rides most of Andrassy's work with Matthew Allen helping out with the occasional gallop and jump-out. Congratulations to Andrassy's justifiably proud owners Ryan Sheehan, Matt Gilchrist, Silvio Lappanese, Miss Joanne Vincent, Jason Reeman, Mrs Amanda Pearse, Rod Pearse, Lindsay George, Alan Wray, Mrs Colleen Wray, Rob Mcguinness, Mark Hawkins, Mick Stinear & Daniel Miller, Seppon Racing (Mgr: Andrew Mcleish) and De La Racing (Mgr: John Mcguinness).